Hairline™ blend was specifically formulated to help maintain healthy hair follicles by dilating the capillaries in the scalp and provide essential nutrients. Most of the essential oils within this blend have been studied for their ability to directly affect the circulation system by vasodilating the capillaries. Additionally, The New England Journal of Medicine has stated that the compounds found within the essential oils in Hairline™ can contribute to as much as 46% hair regrowth. 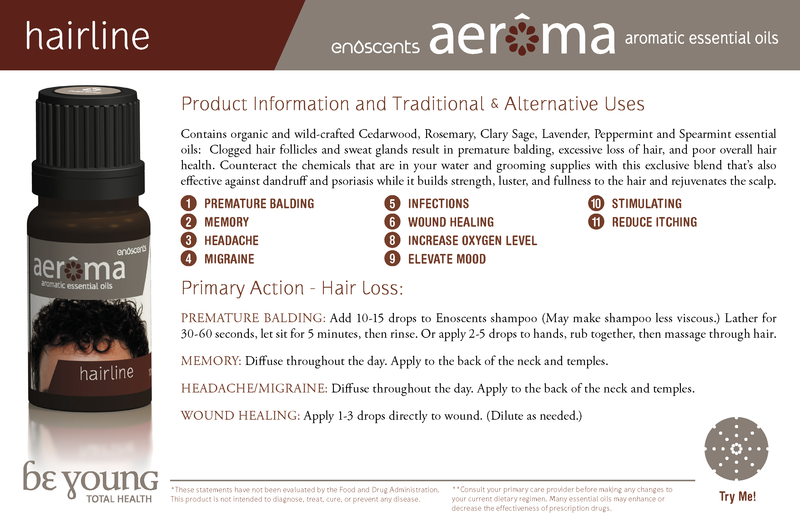 Add 3-4 drops to your Enoscents™ shampoo per use. Work up a good lather and rinse. Add 3-4 drops massage into scalp and apply a warm compress. Add 5-10 drops in a pint of water to help control sugar ants. shake well!